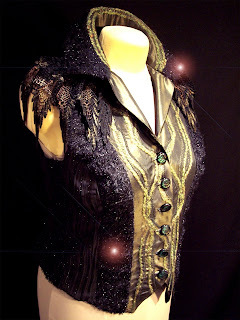 Alrighty, I'm finally approaching "done" on my Elphaba and Glinda vests. I'm trying to get these done so I can send them to Bell Armoire magazine. They put out a call for clothing inspired by the musical Wicked. I'm not sure if they'll even get in, but it's been a joy to put these things together. When I get inspired by something, I kinda go overboard, and that's what I did for this particular self-challenge. I'll send in the garments (the due date is April 15th, so I'll be sneaking in just under the wire), and we'll see what happens. Even if I'm not selected for their photo spread, I've had a blast putting these things together, and I'll sell them on my own sight if that's what I need to do. 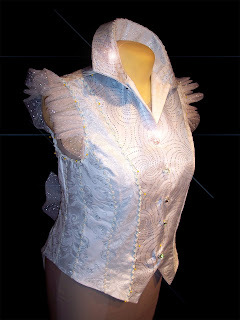 The Glinda vest isn't quite done yet--I need to buy some more tulle for tails on the bows, and add some more trim to some of the seams as well as buttonholes, but it'll get done soon. The metallic blue brocade fabric I used to make alternating panels around the body is actually the same fabric but using opposite sides of it! The center front panel is polyester chiffon with glitter glued on to it in swirling patterns (there is now glitter all over my studio), flatlined with light blue satin. There was so much glue in the chiffon, it actually stuck to the satin!! The buttons are actually cut glass crystal--a whopping $6 each at my local fabric store, and quite heavy but very effective. I think they really finish off the vest. 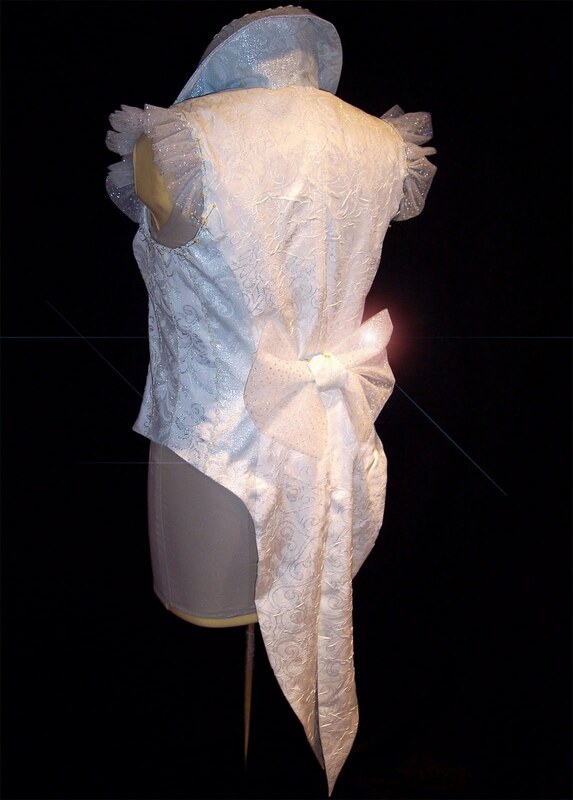 Or will, when I get the button holes in. Haha! The Elphaba vest has handpainted lace, and uses the same pattern as the Glinda vest. 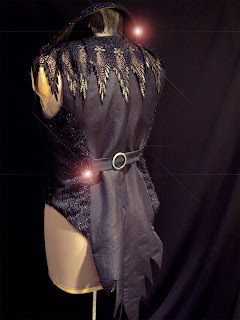 The center front panel is changeable taffeta embellished with sewn on yarn and some decorative fabric stitching, as well as patches of black fabric dye. The collar can stand up like it's shown in the picture, or flip up totally, or lay down flat, depending on the hairstyle. The alternating panels of black fabric were fun--some of them have glitter stripes and the others have almost a furry texture! The swallowtail back is cut with scallops that remind me of ravens or bats or something. Even the buttons (expensive things, buttons...) are emerald in color! I tried a new photo technique tonight--I hung a piece of black double knit polyester on one of my shelves, redirected my overhead clip lights to the dress form, and tried taking pictures that way, instead of waiting until it was daylight to take them out in front of the fence that runs along the back of my yard. Does it work? Anyway, that's what I'm workin' on, and it'll soon be in the mail. Wish me luck! Corey, I'm very impressed with all the details in the vest. It's a lot of work. I hope you win something! I'm also very impressed you manage to get 2 photos displayed with text in between. Thanks for the compliment, Jane! I honestly don't know how the text got around the pictures--when I type a post and upload the pictures, there's a little menu that appears under each image, asking what size it should be and where it should be positioned. After selecting that, I can still click on each image and literally shift it around with my mouse, placing it anywhere I want.. The text wraps itself depending on where I put it.